This is the story of Gatlin's first, and only, Linkubus.I approve of this message.Very short review for a very short story. It's no secret that I'm only still reading these books for Link and Ridley. 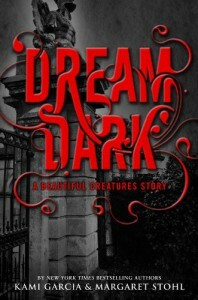 Beautiful Darkness was a bland 2 star read for me. The only parts which had my interest were any scenes with L & R. So it's no surprise that I enjoyed this L & R short much more than I did an actual book about Ethan and Lena.In fact, this might be one of those rare occasions in which I'm going to enjoy the movie version of a book series much more than the books themselves (yes folks, the movie has been cast). The setting and atmosphere of this series will lend itself to a beautiful, gothic and haunting style of movie.Anyway, thumbs up for an entertaining short. I might actually be convinced to try book 3 now if this means more L & R face time. "You don't need me. "She got up, and he knew she was planning a quick getaway. Link grabbed her arm before she had the chance to run. "I'll always need you, Rid. "Reminds me of the ancient (a.k.a. the 1980's) song from Samantha Fox, Naughty Girls Need Love Too.